The paleo diet has become popular in recent years. It eliminates processed food and causes the average person to lose weight, as they consume fewer calories when they eat meat, vegetables, and fruit instead of ice cream and french fries. Unfortunately, the preponderance of “paleo recipe” books ignores the entire theory of paleo: that we were healthier in the paleolithic area, when humans had stone tools and had just figured out how to make tools out of stone. Long story short: paleolithic man did not have cookware. So he did not have soup. 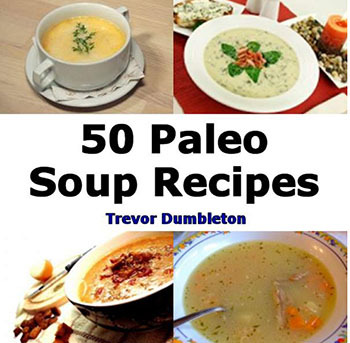 You can go looking for any one of dozens of “Paleo Soup” recipes, but my far-and-away favorite is “Paleo Crock Pot Soups And Stews.” Yes, before carving a rock with a rock to make a sharp rock and endurance-hunting a deer for twelve miles across a cold grassland, paleolithic man made sure to load up his crock-pot with tough meat, so it would be tender when he returned to his cave that evening. There’s also Paleo Crockpot Cookbook and Paleo Slow Cooker Recipes, for the discerning pre-Pleistoscene hominid. No woolly mammoth recipes, unfortunately, despite evidence that paleolithic man hunted this species to extinction.